Since going gluten-free in August 2013, it’s rare that I eat Chinese food, especially in a restaurant, the chance of the establishment not knowing what I mean when asked whether they have a GF menu is saddening, and we usually walk out hungry. So when I met Ivy of Ivy’s Garden Food, creator of tasty Chinese frozen family meals and self-proclaimed “Chinese Supermom”, at a GF Expo in San Francisco a few years ago, I was thrilled to taste her food. Since then, she has expanded from online orders only to having her meals sold at Safeway stores in the Northern California area, as well as stores in Portland OR. I had purchased direct from her about a year ago, however, this time, I bought at Safeway to see the difference in freshness. I was not disappointment in my meal, in either freshness, taste, or value. Currently, Ivy’s Garden Food has 3 delicious frozen meal options – Lemon Chicken, Chicken Nuggets, and Sweet & Sour Chicken, which is the item I tried. The box boasts “simply delicious”, “no preservatives, no MSG”, “made from all-fresh natural* ingredients”, and telling me my meal has “chicken (white meat), pineapple, and green pepper”. I made the meal for my husband & I, however, I did embellish it with added pineapple since I had some in the fridge. The meal was ample enough for “2” (as stated on the packaging) and we enjoyed it over a bed of Jasmine rice (not included in meal). We extended the ingredients by cutting the chicken in smaller more manageable bites (the chicken pieces are bigger than I expected). The sauce so tangy, yet sweet, the chicken was tender. Oh, my mouth is watering as I type! I love having convenient meals, like Ivy’s, available for nights I don’t want to spend much time in the kitchen cooking; it’s there in the freezer, and you have the choice of cooking in the oven & stovetop (about 20 minutes), or in the microwave (less than 5 minutes); I always choose the microwave unless it’s cold outside and I want to heat the house a bit more with the oven heat, and then there is no dirty pan as Ivy provides all you need to cook it. Add chopsticks and we were good to go! IF, and that’s a big IF, you have any leftovers, be aware that the breading on the chicken will not adhere to the pieces after sitting in the sauce overnight, it blends into the sauce. Frankly, I have no problem with this because the taste is great, even day 2. Ivy’s Garden Food can be purchased online or at Northern California Safeway stores. Her website is a wealth of information, with tried-and-true GF recipes, and articles on gluten-free living. I love chocolate chip cookies! Thank you, GFG! Our best recommendation for good GF cookies is to make them from scratch. 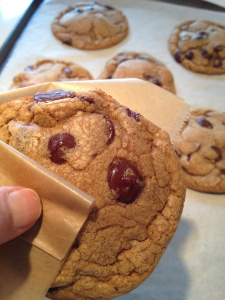 Please try our special recipe which we happily shared for the first time last month: http://glutenfreegus.com/2013/03/19/guss-chocolate-chip-cookies-dog-food-sandwich-solution/; satisfaction guaranteed! Nature Valley Granola Bars GF? My son, who isn’t a GF eater, now prefers Clif bars to be added to his lunches, instead of the dry granola bars I now have in abundance in the pantry. So, as I clear out old soon-to-expire food and move it forward in the rotation to use, this bin of Nature Valley granola bars is staring at me. BGF (before gluten-free), I loved these, but I have avoided eating them now because they don’t say GF on them. I did throw out the box months ago, so I only have the info listed on each individual bar to go by, and there is no mention about wheat, although they do have “whole grain oats” which I always question. Not really wanting to throw them out, I decided to check online for more info about the bars. I found this blog by Gluten Free Girlfriend very helpful, but after reading the comments to her blog post, I have decided not to eat them. Thank you, GF Girlfriend! 3/28/14- Desperate times lead to desperate measures and I was at the hospital on an emergency, having not eaten, I was in a bind, literally about to pass out. I had 2 packages of these granola bars in my purse, I keep them there to hand to a homeless person if they ask for money. I thought twice but needed something to eat and ate one package (2 bars). I feel fine, although I will go prepared next time so I don’t have to be relying on this product. I usually check the ingredients on cans and packaging before I purchase, so I didn’t look at the label before making my enchiladas. 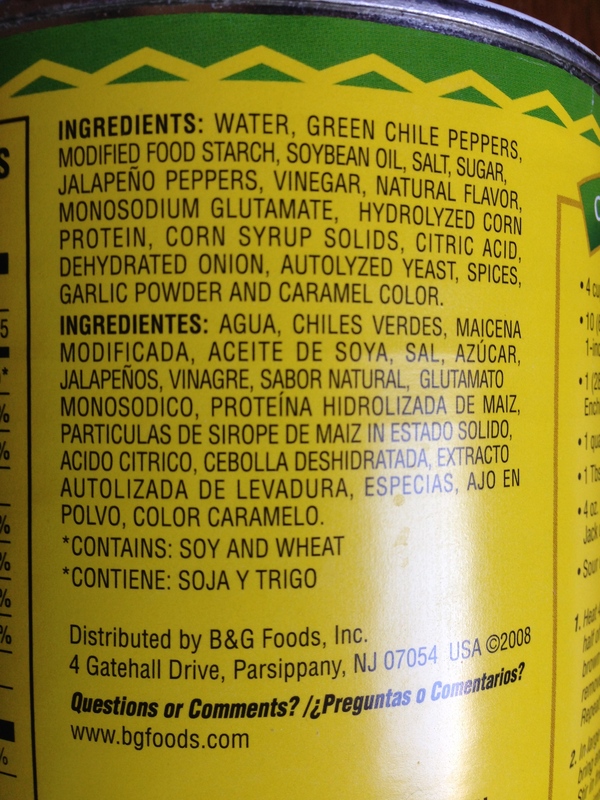 Unfortunately, the sauce was poured before I realized that its ingredients, though none showed wheat, did have a “warning” that it “contains: soy and wheat”. From the ingredients themselves (and I did check my “Glutencheck” app), this was not obvious, and rather than dumping my artichoke & chile enchiladas, I cooked and ate them, with the delusional mindset of “what you don’t know can’t hurt you”. So, I learned a valuable lesson- continue to check labels, even if I purchased it and looked at the ingredients prior to buying…I might have missed something in my rush at the market. 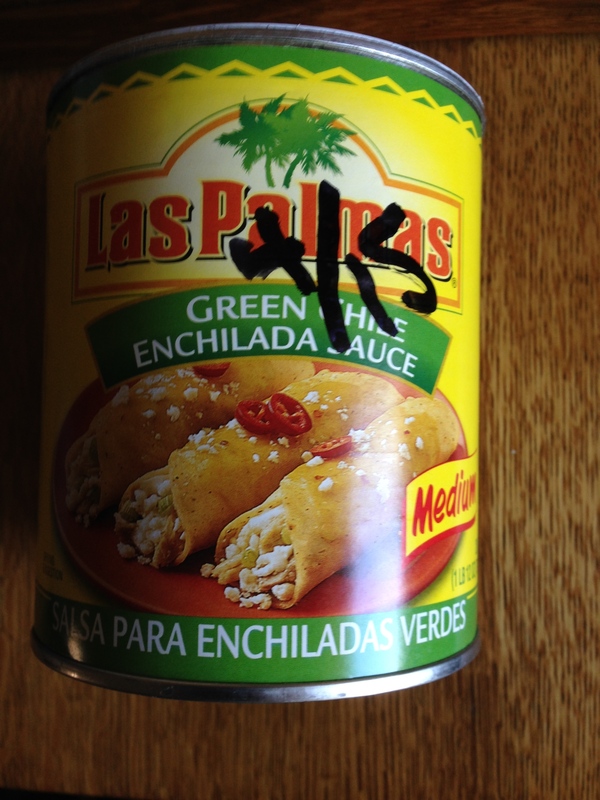 Also, the Las Palmas site, in their FAQs pages, says “Las Palmas Red Chili Sauce, Las Palmas Crushed Tomatillos and Las Palmas Red Enchilada Sauce are all gluten-free.” So next time, I’ll go with the red sauce rather than the green.